Leaving St Lucia we start to haul up the anchor only to find the switch fails with only half the chain up! Fortunately the windlass handle isn’t too buried so we bring the rest of the chain up by hand. This is a must fix as it is very hard and slow work! Fortunately we won’t need to anchor in Bonaire as we will be on a mooring and we will be in the marina before being hauled out in Curacao. We motor to the marina for fuel and water, as we approach the fuel dock the engine dies going into reverse, our approach is somewhat faster than planned! Fortunately we are well fendered and have lines ready to throw to the surprised staff on the fuel dock. As we swing in our anchor scrapes one of the mooring bollards but no real damage done thankfully. Fuelled and watered our engine starts and runs fine, a complete mystery. Finally with calmed nerves we are off. As with all weather forecasts they are just that (a forecast) wrong as usual so for the first day and a half we have more wind than predicted and not from the direction that was predicted. Thankfully the squall is going away! At this time of year the winds should be from the East or South East, we have a North easterly wind, which is a dead run! Not the best point of sail. We sail on a very broad reach, the main reefed and a preventer set, the genoa set on our whisker pole. We are heading further south than we would wish to sail but hopefully we will get the predicted South east wind or we will have to gybe. The seas are bigger than predicted too, often higher than the boom and frequently coming from different angles creating a very uncomfortable ride. ‘Arry, the Hydrovane, is coping very well (much better than the crew) who are struggling to cook, eat and sleep in what has become a ‘washing machine’ down below. Four days of this will be hell! The wind still is from the North east so we will have to gybe - a potentially dangerous manoeuvre at the best of times, much more so in 20+kts of wind and 3m+ seas. We gybe before dark at the end of day 2, slowly and successfully, unfortunately when setting the pole we managed to pull off the bracket holding the aft guy and downhaul to the pole. (We should have eased the downhaul a little bit more before hauling in on the aft guy!). No real problem and a bit of a jury rig keeps us going ok. 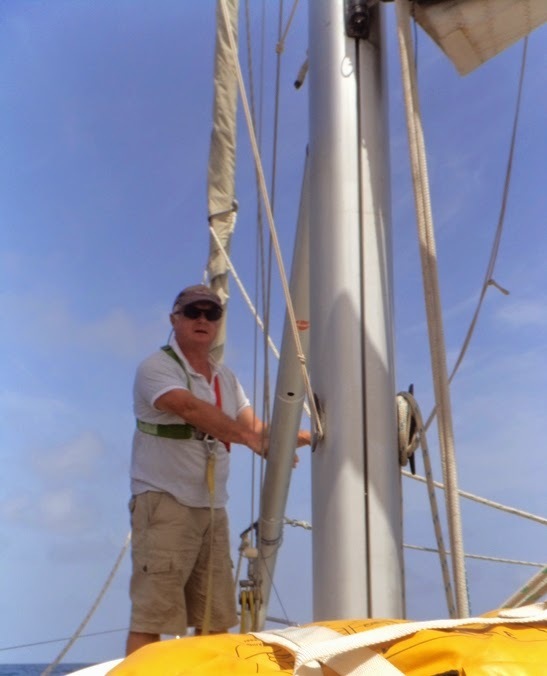 Morning brings light winds and fortunately calmer seas, the winds are so light that we have to revert to the ‘iron topsail’ as we need to keep our speed up so we will arrive by Sunday evening, Monday is predicted to bring strong winds to Bonaire (the result of another tropical wave). A morning of motor sailing and we gybe again, this time we will be able to sail to the southern tip of Bonaire on one tack. The seas are much calmer and the winds steady from the east at 15kts, we have picked up the west going current that will help us towards our destination. We pass the Venezuelan Aves islands during the night only seeing the light from the lighthouse some 7-8 miles away. Bonaire is sighted during the morning and we round the southern tip (gybing again!) and have a very brisk sail to Kralendijk in 25kts of gusty winds. We pick up a mooring close to Yellow Sub dive shop, it is Sunday lunchtime - we can inflate the dinghy later and clear in tomorrow morning. We have sailed 480 miles in 4 days and 1 and ½ hours. A hot shower (not rusty! ), a cold beer, lunch and a snooze are in order. Hello! Glad you made it there OK. We are enjoying the delights of Grenada. Looking forward to Bonaire next season!